From Rust to Ironman: I'm back with a vengeance! I'd thought that I would just leave my blog there - after all, mission accomplished, I'm now an Ironman - but, of course, it never ends there, or anywhere. Once I met a guy who was reported to have been awarded the biggest trading bonus ever paid in the City - 35 million pounds - and the obvious question came to mind: "Why does he keep working?" The answer is obvious and it is that, if you are driven enough to achieve something, once you have achieved it, your drive doesn't just go away overnight. Which reminds me, I'm getting ahead of myself: I've spent the last month and a half in what I've been calling my "Forrest Gump" phase. I asked my trainer for a sabbatical and he said "Fine, as long as you keep on weight training in the meantime". The irony is that he programmed me so much weight training that it didn't really feel like much of a break from structured training. Even so, I've been avoiding as much as is possible training for the sake of training - that is to say, I try to actually get somewhere by running or cycling rather than going on random out-and-back jaunts. I've been running to work a lot more frequently - that's 25 kilometers in total just there - but the Powers That Be have suddenly and arbitrarily decided that employees are not allowed to cycle on campus. This puts a serious spanner in the works because it means that I have to get from the gym to my office using the internal (infernal?) buses, thus adding back all the time I saved combining running and getting to work in the first place. I'm fighting this one at the highest echelons of the company so I hope that it will be a short lived dogma. I've enjoyed running without a heart rate monitor, not worrying whether I'm running too slow or too fast, just listening to the sound of my own breathing and the tap-tap of my feet, or my iPod which I have been using a lot more lately. I managed to build up to running almost 100 kilometers last week, which isn't bad while still being a long way off Forrest Gump territory. I haven't been worrying too much about what I eat (or drink, for that matter) either and, as a consequence have put on about 5 kilos since the Ironman. I'm not bothered about that at all, I've got plenty of time to burn it off and I'm not even sure that it isn't due to the increased weight training I have been doing, rather than the lax diet. But it hasn't been completely without wrinkles. For some reason (er, hello? increased mileage!) the torn meniscus in my knee has been acting up. It doesn't hurt when I am running at all, although I do notice it clicking slightly when I run up hill. The problem is that when I am walking it gets a bit irritating. I'm hoping it will calm down in a week or two. I've also been having some problems with blisters (which, by the way, are the bane of Ultrarunners). It's been the result of me mucking around changing shoes and trying to find the perfect minimalist trail shoe (verdict: Vivobarefoot Evo) and minimalist race shoe (verdict: Vivobarefoot Ultra). Everything was going fine until I decided to watch one of the most tedious films I have ever seen in my life - Ironman 2 - and I couldn't help but entertain myself by picking at the dead skin (and some bits that were still quite alive) on my foot. As a former smoker and nail biter, there is something exquisitely addictive about peeling off dead skin: I go into an almost trance-like state and can't stop until the pain brings me to my senses. Probably the best thing about the last 6 weeks has been my coming to terms with the Ironman. As you will have realized from reading in between the lines of my race report, I was somewhat disappointed with the experience of the race itself, having any attempt to grit my teeth and force out a best performance frustrated by muscle fatigue and having expected to have been overcome by emotion on crossing the finish line. It particularly sticks in my mind the comment of one of my work colleagues after I explained this to him. He said that I had very little "self love" or, in other words, I was too hard on myself. The problem I find with competitions which are so extreme that just finishing them is an achievement in its own right, is that you train and train precisely so that it doesn't seem like a "big deal" anymore. This is where the need to go further and further comes in - and I really want to avoid falling into that trap! During the first few weeks after the Ironmman I suffered the Post-Ironman Blues as can be expected: I suddenly felt aimless, like a rebel without a cause. The weekends did seem incredibly long though, now that I wasn't spending most of them out on the bike. What has started to happen is that I have begun to realize what an achievement it was, finishing an Ironman. Now I can barely contemplate the amount of training I was doing only a few months ago. Now it really does seem impressive and finally I am starting to feel proud of being an Ironman. Are my children at least proud that their dad is an Ironman? I don't think they can really understand what the distances mean, even though I have recently started running one or two kilometers with them (at quite a clip!). Luca (the eldest) still always brings up the time when I came second in a 5k race at work as my crowning accomplishment. By the way, I chickened out of getting a tattoo done but instead opted for something just as permanent but with the advantage that I can take it off: a ring with the magical distance of 140.6 miles emblazoned into it, to remind me that I can do anything I put my mind to. I've decided it's time to get back to work. Jonathan has just sent me my training programme and tomorrow, for example, I have to run 7 series of 3 minutes at above my anaerobic threshold (around 16kph should do the trick) while wearing a weighted flak jacket. I think that will be the fastest I have run all year. I suppose it will be a shock to the system at first, but I am looking forward to doing some speed work again. I recently read that one of the reasons to include high intensity training in the preparation for a Marathon is that you train your fast twitch fibres which get recruited late on in the race as the slow twitch fibres fatigue. It's no good if you have neglected them all season for them to be put to test at the end of a Marathon. I wonder if this was something I should have done in preparation for the Ironman (I did do high intensity work on the bike but not running) - perhaps then I wouldn't have suffered so much from muscle fatigue at the end of the race, who knows. On the other hand, this can interfere with the body's fat burning capabilities - it's all quite a delicate balancing act. By the way, I was flicking through a Brazilian Triathlon magazine last week, one with coverage of the Ironman in Brazil, when I was shocked to see that, out of all the 1,800 athletes competing, they chose a picture of me!! It's actually an article about whether or not to use a disc wheel - which is ironic because my wheel was actually a normal wheel with a plastic cover, but I suppose the same principles apply. a) The Marathon I did in San Sebastian (only the second Marathon I have run) I did in a time of 3:07 with a huge negative split (when you run the first half more slowly than the second half) of 7 minutes. b) All the aerobic base training I did for the Ironman should stand me in good stead. d) If I felt denied my teeth gritting moment in the Ironman, then with some luck I will have it in the Marathon instead. e) This will be the 4th Marathon I've run (if you include the Ironman Marathon) so I have some experience to draw on. f) I'll be running in my super-lightweight Vivobbarefoot Ultras! BREAK 3 HOURS IN THE MARATHON! Congrats on being back... and I agree, don't be so hard on yourself! 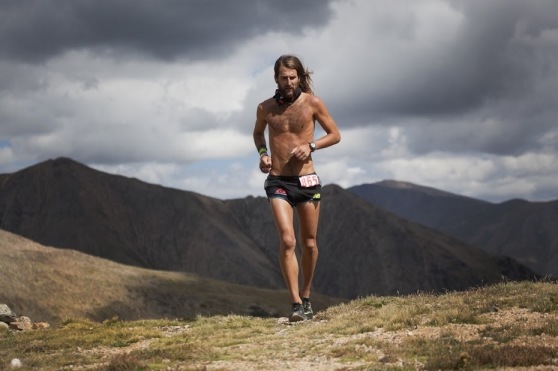 I completely understand being attracted by ultras and trail running. If I ever get back in shape (aquiles relapse), and after improving my marathon time, I'll probably go longer rather than biking and swimming. BTW, 3h is huge, but with your track record I consider it done. If I were you I would also use the occasion to run the Boston marathon (april). You already have the needed time, but if you go ultra maybe you'll get a bit slower, so it can be the perfect time.